Welcome again to our annual sustainability dinner. I've had the pleasure to be engaged with the LIU Post sustainability team furthering efforts here on campus. Thank you to the sustainability committee for providing me the opportunity to speak briefly to you. Dr. Carlin mentioned earlier about many of the sustainability accomplishments and projects we have been engaged in over the past year. I am very happy to see the progress that LIU Post has had on campus in a short period of time. Aramark is enthusiastically looking forward to further partnerships with LIU to drive the culture of sustainability on campus that Dr. Carlin mentioned. As the Regional Culinary and Sustainability director I am frequently asked to speak on a variety of topics. Most notably sustainable foods, environmental sustainability, industry trends in higher education dining, allergens, food safety and health and wellness. Over my past 19 years in the industry I have certainly seen many changes. Our responsibility as Chefs has changed significantly from that of provider to include things like educator, sustainability advocate and dietitian. As someone who frequently has the opportunity such as this to engage with students, I recognize my responsibility to help form future eating habits. I've been striving lately to determine how to make better food choices myself. By "better" I mean, holistically: focused on health & wellness, reducing waste and carbon footprint, while procured responsibly. It is necessary for us to consider the bigger picture of what impact sustainability will have -or more appropriately, will NEED to have on our global food culture. We do face some severe challenges particularly in the next 10-20 years when the needs of a growing global population will force an increasingly larger number of us to go hungry. Simply raising more cattle or growing more crops is not going to be enough to meet that need. In the last 50 years global meat consumption has quadrupled to 300 million tons. As populations get richer, their consumption of meat, dairy and eggs also rises. The current rate of population growth is projected to reach 9.7 billion by 2050. At this exponential rate, we will need at least 70% more meat protein than we already have. The anticipated world population by the end of the century will crest 11 billion. UN studies have estimated that unless our dietary choices change we could face a global collapse in as early as 30 years. Facing this challenge, it is easy to look to the world's ocean for possible solutions. Covering the majority of our planet, there is more opportunity here than land-based food systems. However, our fisheries are 2.5 times larger than what our oceans can sustainably support. We take far more fish from the ocean than what it can naturally replace. Our global marine life has been slashed in half. Over 90% of world-wide swordfish and tuna populations have disappeared since 1950. We need to alleviate the pressure here by turning to aquaculture. Yet while aquaculture has made significant improvements and a noticeable impact on our global food supply continued advancements must be made on fish feed and habitat conservation. Adopting this dietary choice means its likely you're eating caloric-light yet nutritionally dense foods. I recently traveled with some business colleagues to Portland, ME where we visited a popular tapas place. As the chef of the group I was nominated to order for the tables. Interestingly enough the unanimous vote was that the two best dishes of the night were the smoked carrots and ras-al-hanout spiced pan-roasted cauliflower -ironical the only two vegan dishes. As Chefs its not about making vegan food popular, it's about making great tasting food and sustainable ingredients just taste great -oh and it just happens to be vegan. The focus on global sustainability will allow us to tackle the much larger issues like world hunger and innovative farming opportunities to feed our ever growing world population. Embracing the challenge of summarizing world-wide sustainability efforts our team was tasked with creating an entirely local and sustainable vegan meal taking full advantage of the great seasonable ingredients available here on Long Island. Big Thank you to our catering director Greg & his team for waiting on us tonight and Chelsea our District Marketing manager for putting together the marketing materials to communicate where we sourced our ingredients. Lastly, Chef Justin and his team for creating this vegan dinner for us to enjoy. I'd now like to introduce Chef Justin Poly introduce you to tonight's menu you're about to enjoy. Last year Aramark piloted a program called the Uncomfortable Dinner Party at the National AASHE Conference. While our intention is certainly not to make everyone uncomfortable, when discussing sustainability there are many topics which are sensitive to speak about in mixed crowds. Certainly not everyone in the room today is vegan, yet we offered an entirely vegan menu. There will be many pounds of of food scraped from plates today and addressing food waste is a real issue. As I had mentioned earlier we are fortunate that today is a day we get to eat -and that cannot be said for everyone world-wide. 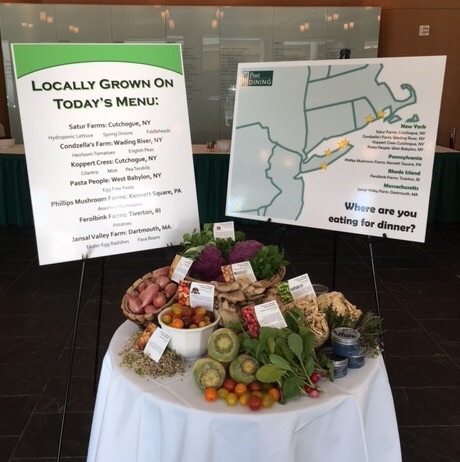 Not only do we get to eat, but we will eat a meal prepared today by our own private chef, from the best organic farms available on Long Island. There are quite a few socioeconomic issues with even the types of food we consume. The idea behind the uncomfortable dinner party is openly discussing these issues. Both the good and the ugly -and not for the purpose of causing guilt, but to clearly discuss opportunities for improving our world-wide food system. As we invite you to the buffet to enjoy tonight's dinner, we have placed on your table some discussions topics. These are questions designed to spur conversation about our own food culture. I was invited several week ago as a guest speaker to Dr. Brown's environmental sustainability class. One of the topics for discussion is how students today can affect global change and make a real impact. As Dr. Carlin pointed out earlier, the secret is driving and expanding our on campus food culture. You as students can make a real and meaningful impact on sustainability on campus, across the state and globally as you enter the work place. Use these topics as a genesis to having the difficult conversations to help change the world.